Anne George welcomes me into her studio one sweltering Minnesota evening in late June. I’m greeted by the soft flutter of crepe paper flagging through the air as a standing fan oscillates. 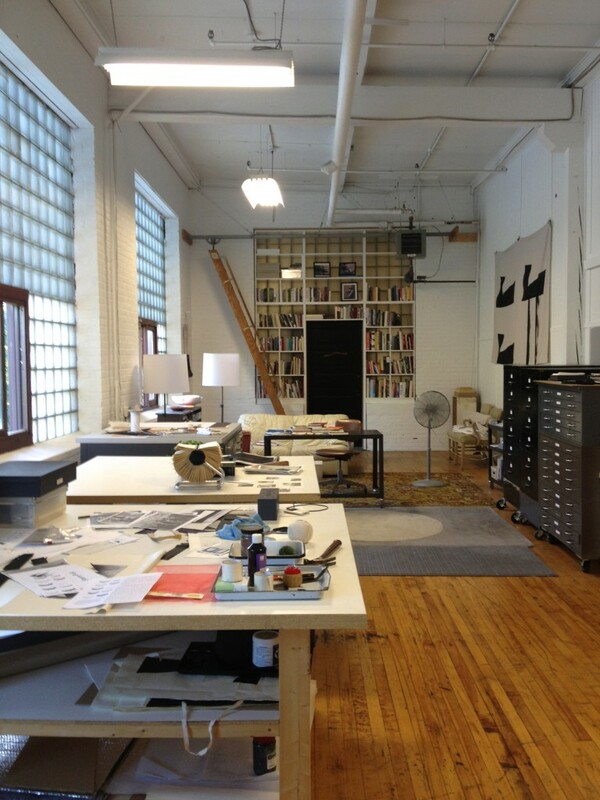 Her studio is — through my aspiring eyes — quite dreamy; easily 1,000 square feet laid out in the form of an “L,” with generous daylight, massive walls, large utilitarian carts, flat files, a built-in bookshelf wall and seating area. Together we walk through several bodies of work, each which investigates medium as subject, and draw connections between formal interests, slippage of language, and non-fixity with respect to “gesture” and artists careers. George’s earlier work was centralized in printmaking with a conceptual interest in sequential nature of film. 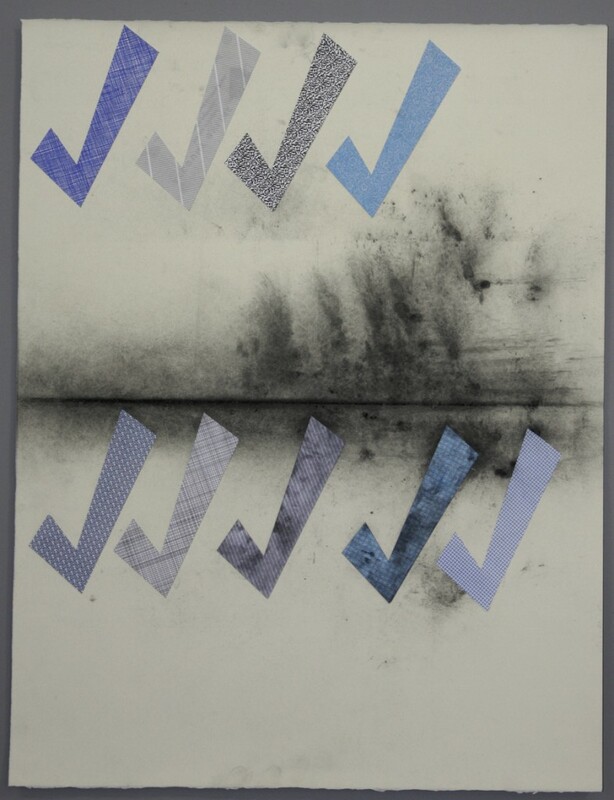 Influenced by film and video’s emergence, and acceptance, into contemporary art practice during the 1990s, she transcribed an interest in time and framing into a motif of pagination carried out across books, prints, and multiples. Choice in medium, format, and therefore subject, within George’s practice tends to shift by happenstance and introduction, rather than placing an exterior interest into the medium as a vehicle. In example, her interests shifted from books and prints to working photographically, through the catalyst of simply being given a camera. The medium itself then becomes the cause for its employ. She’s not interested in resolving topical or content issues, rather the issues specific to medium, form, and the properties of both. Her earlier work in digital photography, bypassed traditional photographic concerns for framing, subject and documenting contemporary history. Rather, she became interested in the qualities of the digital mark – the pixel – and its ability to shatter and break apart an image. Digital cameras and resolution quality are now a part of everyday vernacular, but in the mid-90s this was an exploration of the nature of the object of the camera and its output – with concerns for what is can do, what kind of information does it transmit – rather then engaging the language of the photograph as commentary on, or reflexivity of, the medium. George’s material interests are also apparent in her concerns for resolving two-dimensional design applications though drawings. She works on a smaller — we’ll call it store-bought — dimension, which bears a nice relationship to the body. Easily at arms length, the size of a torso, or something you’d carry. On that size, one’s hand can caress the paper and enjoy its smoothness, burrs, and other tactile qualities. George will also enforce the drawing paper by stretching it over foamcore, creating an airy tablet. George approaches the substrate employing everyday materials as formal, and physical, “gestures.” For George, the notion of the gesture sprawls out in all its semiotic glory: as an action, doing, articulating movement through space, occupying dimensions, acting as lines, or compacting into iconography. One drawing bares a craft-paper brown bow on a dirtied piece of 18” x 22”paper; the charcoal-smudge across the paper’s composition a gesture as well. A decorative bow — the same thing one would find affixed to a present — is inducted as a drawing implement. As gesture, the bow has association with the act of gift giving, it signals appreciation — a warm gesture — and, located on the drawing’s surface, recalls the bodily motion of securing it with a gentle, pressing force. Its loops, folds, curves and bends, can be unraveled through one’s vision as a undulating planar line in space. All of these gestures George compresses in the bow. The drawing slips in out of flat space and sculptural space; just sitting there — half-object, half-image — it embodies art as an offering itself, being set into the world like a metaphoric open hand. A few other surfaces are adorned with paper shopping bag handles, seemingly functional, like little portfolios an art student might have filled with prints. Other non-traditional materials employed in the artists compositions include the ephemera of everyday: tape, paper, scraps, clippings, the kind of stuff organized by bins of some sort — recycling, discounted fabric, dust, hardware, discount. The drawings and their implements live between substrate, medium and object, each material forming a sculptural drawing or character. Though George is hesitant to say character, or even symbol; these meanings are fixed. Gesture implies malleability, movement, action. She holds her hand in the air, pursing her index finger on her thumb and waves her forearm side to side. This is the motion we all make when we perform the charade for “Drawing.” We also happen to be miming the production of a check mark, or tick. This check mark is the most reductive form of “gesture” for George — a readymade gesture – and we see this formal element reoccur throughout her oeuvre, pointing us to a movement, line, shape, and its denotation. Check. Good, I completed this. Or bad, I supposed, when next to our names on an elementary chalkboard. It is a simple and reductive motion, and drawn line, symbolizing both doing and undoing. Those things accounted for, or simply: yes. George’s palette is also reductive, working in the values and colors inherent to her substrates, drawing implements, and readymades, often black, brown and their tonal and textural variances — sometimes glossy, inky, dull, or matte. Her lack of pigment allows for greater emphasis on form, as well as removes the connotations of color from her compositions. Along side object-drawings and material collages, George continues to work in book format. Her artists books are living documents, rather then a finalized container for a collection of content and function more like notebooks and sketchbooks. They allow her to work in demonstrations, exercises, and modular units. On each page she introduces new problems to solve and alternate delineations to break apart, ruin, pull back, and reclaim. Each page gets eradicated and repaired, interrupted and completed. The drawings, while manipulatable, are also vulnerable, delicate and often times loosely assembled, such that an element can detach, fall or hang limply; all of these actions being gestures as well. 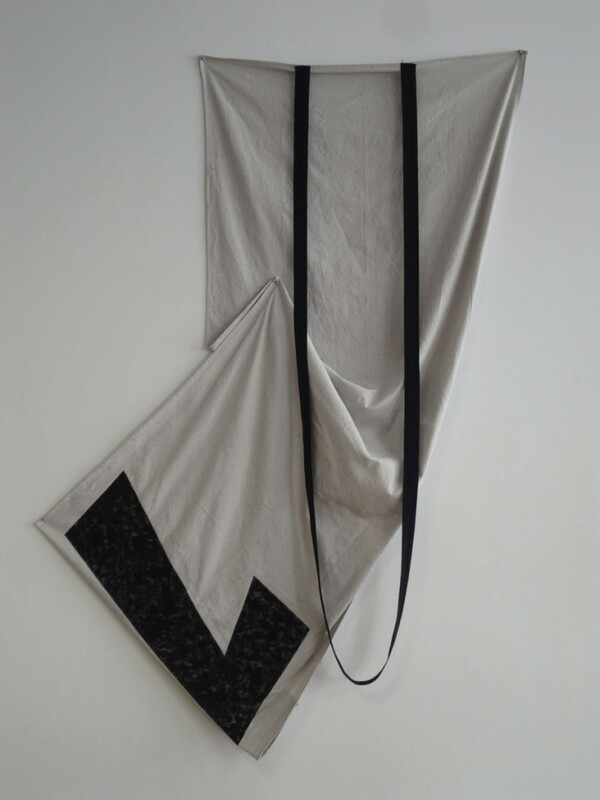 In her newest works, the Banner series, draping tarps speak their own language, hanging raw with solid icons, panels or washy stains. While she’s not one to look into the self-awareness of medium, these new works invoke the language of painting. George is quick to say that she has, “never been a painter,” in fact, in her formative years was adamantly anti-Painting. George recalls from her instruction that, “in the hierarchy of art processes, painting sat predictably at the top, valued over the others.” It was this disdain that motivated George to pursue less predicated avenues — or those lower on the ‘hierarchal’ totem – for production. She confirms this is an old ethos, but it is a reminder of her influences and values. If her pages, tablets, boards, are intimate and flexible palimpsests, the tarps provide a solution for scale and durability, as well as offer an out from the traditional picture plane. The weight and texture of the material and its ability to accommodate forward-jutting attachments, allow the piece to suspend between image and object. This discursive and gestural, ne symbolic, properties of the tarp pieces are amplified when George introduces the accompaniment of tributary objects and loose images as a supporting cast. Despite the spatial orchestration of the arrangement, George is also hesitant of claiming territory in sculpture and installation – she didn’t confirm this, but I suspect that it, too, is because of the hierarchal weight of those disciplines. In plain speech she said she ‘didn’t really like having those objects around. ‘ Which, as an artist who produces wall-hanging work, I grinningly agreed with. Where do these things live? 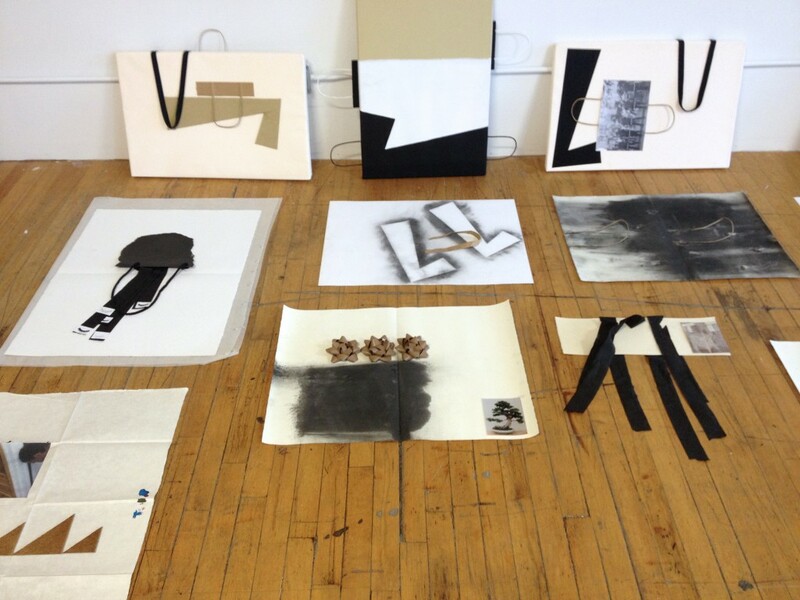 Does it really matter if her work fits neatly into a league of drawing, collage, sculpture or another discipline? I would argue that it does. Not that the lack of identification and medium-specificity is detrimental to knowing what she makes, but it is precisely that she is not concerned with these medial differences that defines the ambit of non-fixity of her practice. After all, an artists work is defined by as much by what it is not as by what it is. Her work is about an output that lives between and around objects and images — this is also what the works do — they escape the picture plane and point away from themselves – these are the areas of interest. It’s not the thing. It’s the movement that expresses the meaning. It’s the gesture. With gesture as the subject, Anne George is more interested in formal and compositional resolutions then pursuing medium or composition as a vehicle for content. Whereas some artists tend to load a lot of narrative into work — in promotion of an idea, or inclusive of a story — she’s not that kind of artist. She is willing to offer us a premise. 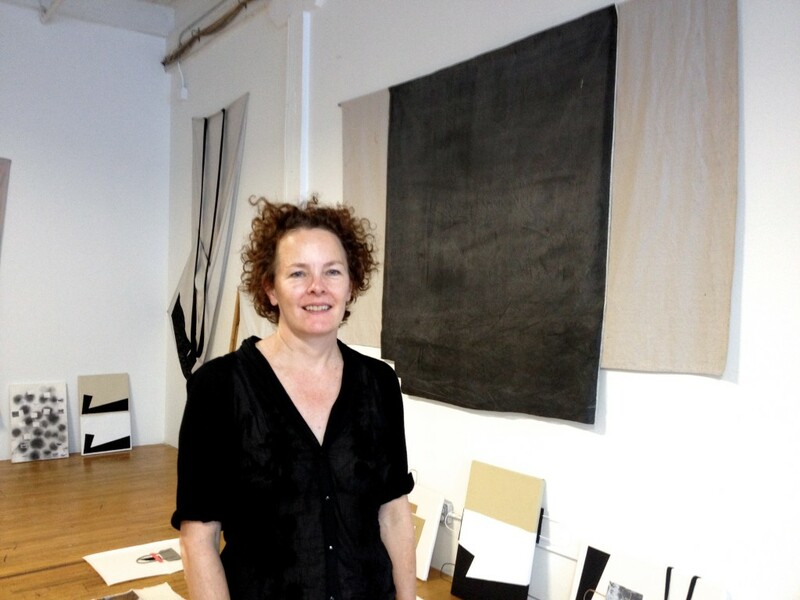 She is also aware of that, now, and encouraged that artists to also be open to non-fixity in their work and pursuits. Gesture, in its non-fixed nature, allows for a longer life and an open reading, which also allows for artists to be agile, open their work up for new audiences and markets, and continue to offer new approaches through the gesture of their individual practices.